The Dr Chau Chak Wing Building is the first building in Australia designed by Frank Gehry, one of the world’s most influential architects. It is a key element of the $1 billion redevelopment of the University of Technology, Sydney (UTS) City Campus and will provide teaching, learning, research and office space for UTS Business School. The building is named for Australian-Chinese businessman and philanthropist Dr Chau Chak Wing, who donated $20 million to the project, along with $5 million for Australia-China scholarships. 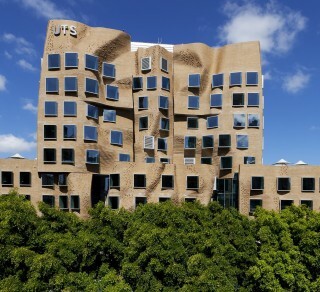 UTS sought out Frank Gehry as architect because of his experience in the development of creative spaces, including museums and educational facilities such as those at the Weatherhead School of Management, Massachusetts Institute of Technology (MIT) and Princeton University. The design that emerged is striking not only on the outside but also – more importantly – on the inside. Frank Gehry’s creative reaction to what he learned about UTS Business School’s approach to learning and research was to sketch a ‘treehouse’ on a café napkin – imagining a building where people can undertake quiet, focused work in offices and other rooms in its ‘branches’ then meet in formal and informal social spaces in the ‘trunk’. Gehry Partners designs ‘from the inside out’, meaning the interior spaces must be developed before work on design of the building’s exterior can begin. The exterior emerges only as a result of what will happen inside the building.